NEW BERLIN, N.Y. (August 11, 2018) - After months of anticipation, the three-rider lineup for the United States at the 2018 FIM Motocross of Nations (MXoN) was officially announced Saturday, just prior to the Massey Ferguson Unadilla National, Round 10 of the 2018 Lucas Oil Pro Motocross Championship, sanctioned by AMA Pro Racing. 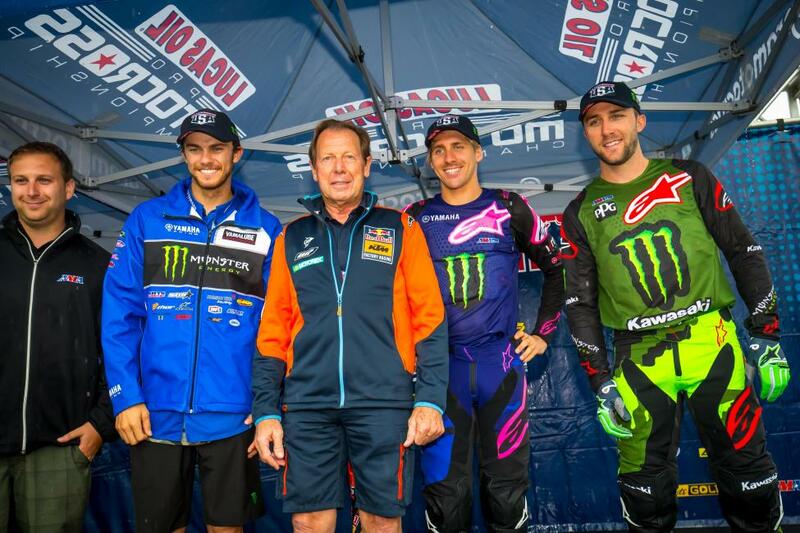 The American Motorcyclist Association (AMA), in conjunction with MX Sports Pro Racing, named Monster Energy Kawasaki''s Eli Tomac, Monster Energy/Yamaha Factory Racing''s Justin Barcia, and Monster Energy/Yamalube/Star/Yamaha''s Aaron Plessinger as the three riders that will lead the host country into action at Michigan''s famed RedBud MX on October 6-7. Aaron Plessinger, Justin Barcia, and Eli Tomac will represent the United States at the 2018 Motocross of Nations at RedBud Motocross Park. The 2018 MXoN will signify the event''s fourth visit to the United States, joining Unadilla MX (1987), Budds Creek Motocross Park (2007), and Thunder Valley MX Park (2010) as the only domestic venues to host the world''s biggest professional motocross race. The United States, which has won the Chamberlain Trophy a record 21 times, has emerged triumphant in each of the three previous MXoN events on home soil. Tomac, Barcia, and Plessinger will take on the task of not only continuing that tradition, but also ending France''s four-year winning streak. A victory at RedBud would subsequently end a six-year winless drought for the Americans, who will once again be led by United States Team Manager and global motocross icon Roger DeCoster. As the defending Lucas Oil Pro Motocross 450 Class Champion and current point leader in the world''s most prestigious off-road motorcycle racing series this summer, Tomac will take on the role of Team Captain and compete in the star-studded MXGP division. Over the past two seasons of Pro Motocross competition Tomac has won half of the races he''s entered, including a dominant 2018 title defense in which he has won seven of the first nine rounds, and is on a path to repeat as National Champion. This is the third time Tomac has been a member of the U.S. lineup, after competing in MX2 in 2013 and the OPEN division in 2014. In each of his two previous attempts the Colorado native showed the trademark determination that has made him the superstar he is today, and he is sure to leave it all on the track for his country at one of his favorite venues. "Having the opportunity to race [the MXoN] and represent your country in front of the world stage is a feeling like no other, and this year with it being at RedBud it''s going to be next level for the entire event, and fans will be going absolutely bonkers," said Tomac. "Myself, Justin [Barcia], and Aaron [Plessinger] will be ready for the battle, and it''s a track that suits our riding style. I have a really good feeling this is the year the USA gets the Chamberlain Trophy back in hand." Barcia is the most experienced member of the U.S. lineup, having competed in the MXoN three times in 2012, 2013, and 2015. He''s competed in the OPEN division in each of his previous attempts and will do so again at RedBud, a track where Barcia has won before in the 450 Class. This season Barcia has been a fixture on the podium and currently sits in a tie for third in the championship standings. He''s made the most of a fill-in opportunity with Factory Yamaha, and has effectively become the manufacturer''s best premier class rider on a global scale this year. Like his U.S. teammate, Barcia has always brought forth his best efforts at the MXoN, and he''ll be more motivated than ever to put on a show for the home fans and bring the title back to the States. "To be chosen for the MXoN is an honor. I''ve gone there in the past and always have done really well in my class. I thrive in that atmosphere and to be chosen again just shows that I''m getting back in my stride," said Barcia. "Going to RedBud is really cool. The fans there for the Pro Motocross races are crazy, so I can only imagine how they''re going to be this year. It''s going to be absolutely insane. I know we have a really solid team this year and it''s definitely time to put the U.S. back on top. We''ve been chasing it for a few years now and we''ve come up short a lot, so it''s definitely do or die now that we''re on home soil. We''re going there to get that trophy back. I can''t wait!" While he may be new to the MXoN experience, the atmosphere at the event should suit Plessinger nicely. With his laid-back demeanor and fun-loving attitude, Plessinger embodies the ideal mentality to have when the stakes are as high as they''ll be at RedBud. Throughout the 2018 season the second-generation racer has been nothing short of incredible aboard his 250cc machine, and he''ll no doubt be one of the favorites in the MX2 division. This summer Plessinger has enjoyed a breakout campaign that appears well on its way to bringing him the first national title of his professional career. He''s dominated the 250 Class with five wins through the first nine rounds, including a 1-1 effort at RedBud in July. The once-in-a-lifetime experience that awaits Plessinger at the MXoN isn''t lost on the rising star, and he''s ready to join his teammates in putting the U.S. back on top. "Being selected to race for the U.S. is something I always dreamed of since I decided to make this my career. I''m so excited to get to represent my country and race alongside two guys I really look up to in Eli [Tomac] and Justin [Barcia]," said Plessinger. "With [the MXoN] being in the U.S. it couldn''t have been a more perfect year because, if you know me, you know that repping the red, white, and blue is a part of my lifestyle! I''m just going to keep doing what I''m doing on the track because it''s been working so far. I can''t wait to see all the fans and hopefully keep that trophy here in the States!" The 2018 FIM Motocross of Nations from RedBud MX will commence on October 6-7 with over 30 countries vying not only for a spot in the coveted classification of nations, but for a chance at capturing the famed Chamberlain Trophy. The 2018 Lucas Oil Pro Motocross Championship continues today at Unadilla MX with the Massey Ferguson Unadilla National. First motos of the 10th round can be seen live on MAVTV at 10 a.m. PT / 1 p.m. ET. The second 450 Class moto will air live on NBC broadcast network at 12 p.m. PT / 3 p.m. ET, while the final 250 Class moto can be seen via tape delay on NBC Sports Network at 4:30 p.m. PT / 7:30 p.m. ET. Additionally, all of the action can be seen as it unfolds online via the "Pro Motocross Pass" on NBC Sports Gold. The Lucas Oil Pro Motocross Championship, sanctioned by AMA Pro Racing, features the world''s fastest outdoor motocross racers, racing aboard the best bikes each factory offers, on the roughest, toughest tracks in the world. The 12-rounds series begins at Hangtown in May and ends at Indiana''s Ironman Raceway in August. It includes stops at the premier motocross racing facilities in America, with events in California, Colorado, Pennsylvania, Tennessee, Michigan, Massachusetts, Maryland, Minnesota, Washington, New York and Indiana. The pro riders race on Saturday afternoon, with competition divided into two classes: one for 250cc machines, and one for 450cc machines. The Lucas Oil Pro Motocross Championship is managed by MX Sports Pro Racing, the industry leader in off-road power sports event production. The series is televised on NBC, NBCSN and MAVTV and streamed live on NBC Sports Gold Series partners include Lucas Oil (series title sponsor), Red Bull, WPS, Fly Racing, GEICO Motorcycle, MotoSport.com, Garmin, 100%, KTM, FMF, Deltran Battery Tender, Pirelli, Suzuki, Husqvarna, Pivot Works, Vertex, Alpinestars, KMC Wheels, MotionPro, VP Racing Fuels, Acerbis and Racer X. More information can be found at www.ProMotocross.com.